In an era of introductory offers, discount codes and flash sales it often feels like loyalty isn’t rewarded, and this has never felt right to us. We wanted a way to show our appreciation to our customers – especially the loyal customers who come back time and time again – to thank you for choosing to shop small and supporting our tiny business. 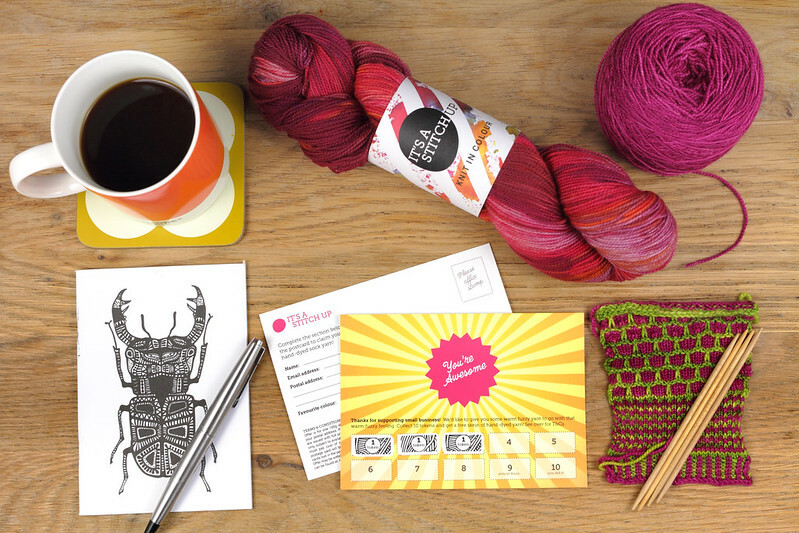 So, we’ve come up with something a little different and more fun… our Yarn Loyalty Card! It’s simple – collect the tokens issued with yarn orders. You’ll receive a postcard with your first qualifying order that you can use to save your tokens. When you have a full postcard with 10 tokens, mail it back to us and we’ll send you a free skein of our beautiful Favourite Sock merino 4 ply yarn. Bonus! Sweater packs, and sale goods and goods that have other discounts applied are excluded. The offer is for one 100g skein of hand-dyed sock yarn and shipping to your postal address. Preferred colours are subject to availability. The offer is only available by post, by returning a completed postcard (or any card!) back to us with 10 tokens. Sender must pay cost of returning this postcard. Cards received with insufficient postage paid will be rejected. We are not responsible for cards lost in the post. Tokens are issued at our discretion with full-priced full-size skeins of hand-dyed yarn only. Tokens are not issued with undyed yarn, sale yarn or any goods other than those listed above. Tokens are only issued on orders placed after the scheme launch date of 3 January 2018. Orders placed prior to this date are not eligible for tokens. We may request additional proof of purchase (e.g. order numbers) to accompany your tokens. Lost tokens will not be replaced. Offer may be withdrawn without notification. We reserve the right to make changes to the offer at any time. Any updates will be posted to this page.